SLOW FOOD TRAVEL MONTENEGRO- FIRST TOUR OF ITS KIND IN THE BALKANS! KATUN ROAD MONTENEGRO - BOOK YOUR PLACE NOW! 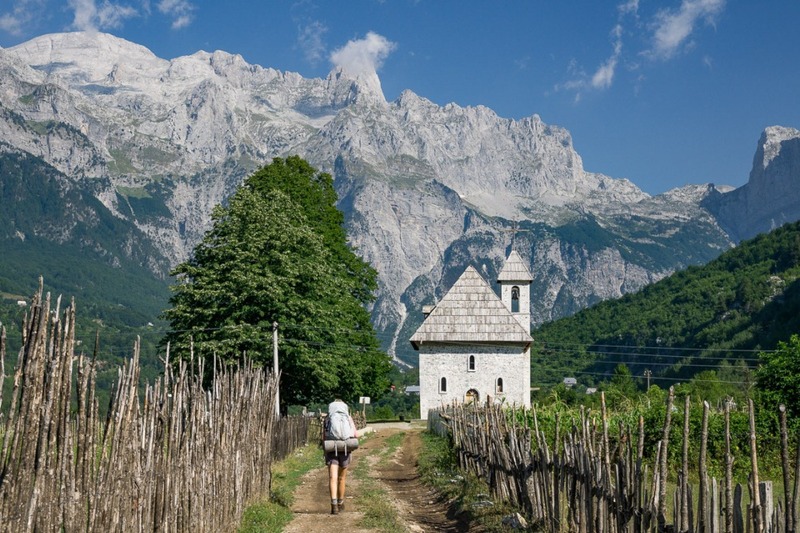 This “Peaks of the Balkans“ trekking adventure takes us to the border triangle area of Albania, Kosovo and Montenegro where a new International Peace Park has been established. 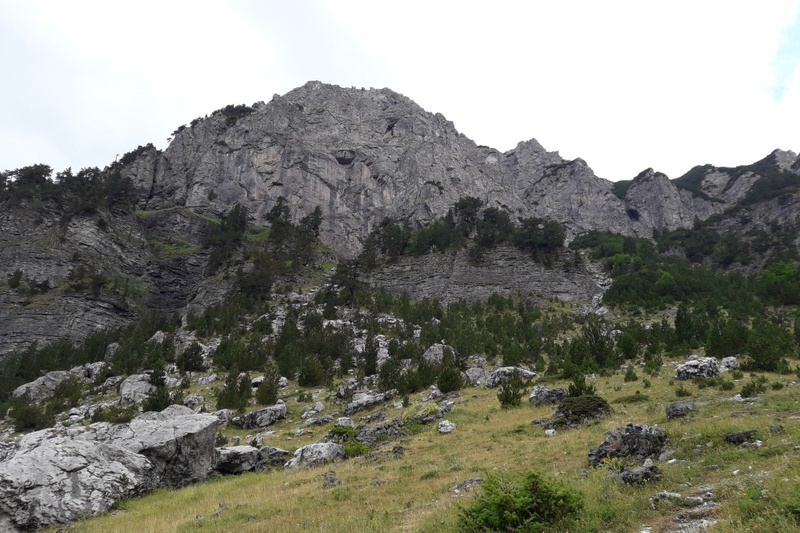 The trek takes place in the Dinaric Alps where people have lived for centuries, as shepards and farmers. Famous for their hospitality, and challenged by a changing world, this trip promotes sustainable, nature-based tourism that gives hope and real economic benefit to the local population. We spend each night in rustic inns or guest houses that have been established along the route where locals provide our meals. Luggage is transported by local pack animals or cars, depending on the day. This is an area of spectacular nature including rare flora and fauna. Rugged peaks rise from alpine lakes and lush green meadows. With this new project, border-crossing procedures for hikers have been simplified and a mountain security system has been established. Our local guides are trained according to international standards. Free time till dinner. Accommodation in private guesthouses. After breakfast start hiking via Ropojana Valley. On the way hike pass near Ropojana lake which is the border between Montenegro and Albania. 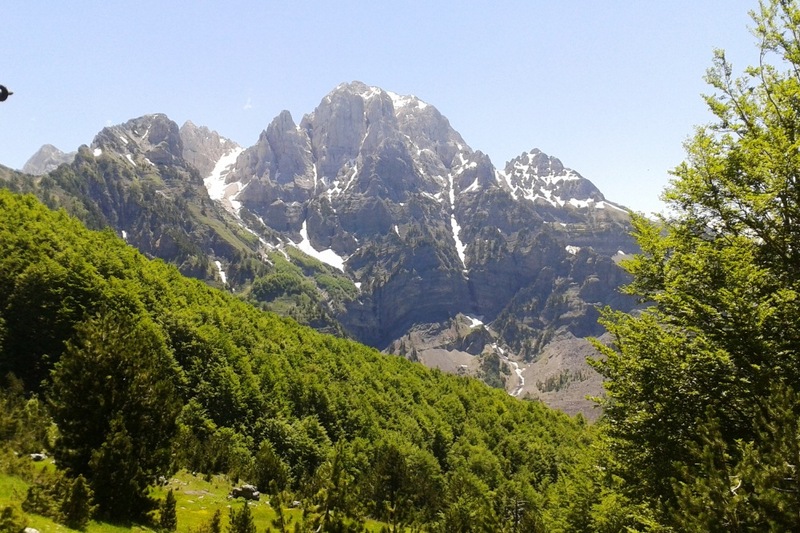 On the way will enjoy in numerous of view point to the peaks of Albanian Alps, how is know mountain Prokletije. Arrival in Theth at the afternoon. Accommodation in guesthouse. Dinner and overnight. After breakfast we start with hike. Lunch – lunch package. The trail will continue in the center and then up to Gjelaj then through the forest and field Bregu I Bubes. Before of the Valbona pass we have chance for a small stop to drink something and to get more energy before leaving the Thethi valley. 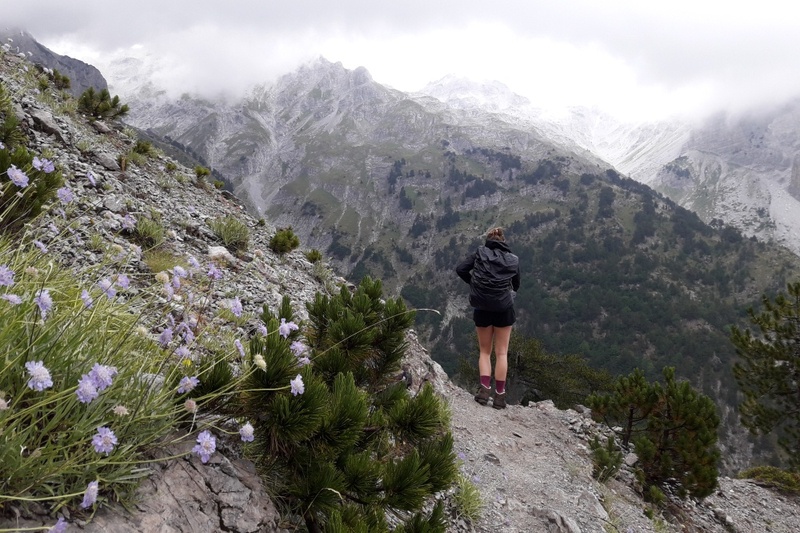 After that we have 40 min walk to the Valbona Pass which is 1670 m above sea level. 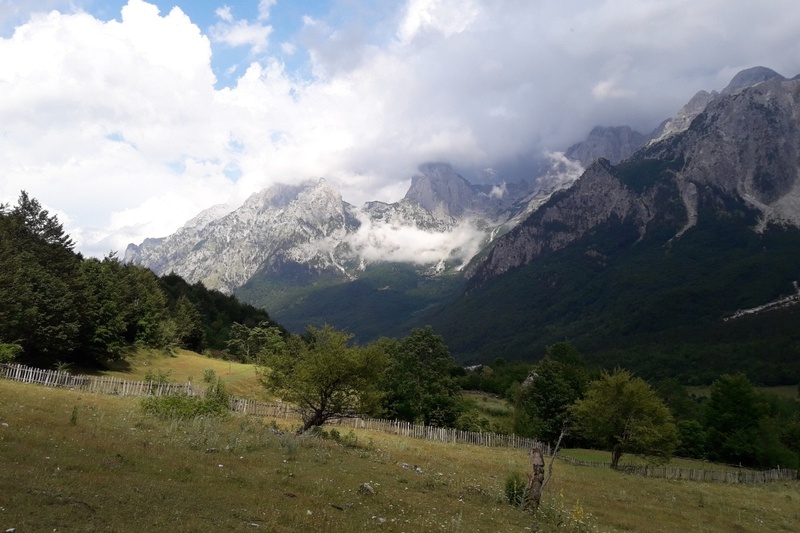 From this point we have to walk down to Valbona valley. A minibus will await for us in Rragam to take us to the guest house. Dinner and overnight. Distance trail 13.9 km , Time 7 h.
After breakfast start with hike. Lunch-lunch package.Çerem is a small village, largely abandoned, located approx. 17 kilometers northeast of Valbonë. At the moment it is populated only during the summer time by shepherds. The village is empty during the winter time due to poor weather conditions. Dinner and overnight. From Çerem, the hike climbs up to the Montenegrin border (Borid Qafa), passes the beautiful summer shepherd’s village. Enjoying in magnificent view to the peaks of prokeltije, Zla Kolata, Dobra Kolata. Continue downhill to Vusanje. Arrival in Vusanje, End of program! AGENCY RESERVES THE RIGHT TO CANCELL THE TOUR DUE TO INSUFFICIENT NUMBER OF CLIENTS. Slow food is an international movement which promotes healthy homemade food, old breeds and seeds, old crafts work, authentic and healthy way of life. The katuns are active from mid- May till mid September, when farmers move back to their villages. As in all other katuns, the whole life here is dedicated to caring for cattle and to cheese making. Peaks of the Balkans - This 192km circuit will take you through the mountains of northern Albania, eastern Kosovo and southern Montenegro. The official route offers a diversity of landscapes and cultural experiences, but it does include a few asphalt road segments. Rams Travel agency have been operating from 2005 year. It is a family run company in the ownership of Musa and Sabina Ramovic. The main activity of the company is providing services in the field of tourism. Tame the wild beauty with Rams.